(at the SD Concourse Building). and/or Free Street Parking after 6pm. 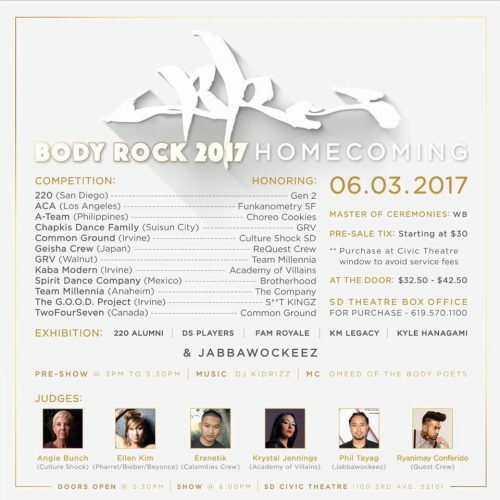 “Body Rock” is one of the most prestigious and respected hip hop/urban dance competitions in Southern California. What began as a small hip hop dance competition called Bustagroove in San Diego has now grown to an International Event commonly known as the “Superbowl of Dance”. Teams from China, Japan, Brazil, Russia, Philippines, …and all around the globe make the annual trip to share the stage with California’s best dance teams/crews. In its 18th and final year of production, Body Rock wishes to celebrate many of the moments and performers that inspired our audiences and allowed us to be the amazing platform that we are for dancers and artists. With the use of social media, our staff chose “memorable moments” suggested by our audience to relive and integrate into this year’s theme for the competition. “Homecoming” means a return home…a return of a group of people (usually alumni) to a place regarded as home … via a celebration, or dance. With this intention, we have invited previous champions and alumni to exhibition one last time. And we have also asked the competing teams to integrate a part of their competition piece to honor past teams and inspirational performances that took place on the Bustagroove/ Body Rock stage. These moments are not an ultimate list. We chose to honor as many as we could fit into a three hour event. And for the “moments” we could not fit, we thought best to honor in our social media platforms. We are so excited to relive and reunite with everyone that has been a part of our road to Body Rock journey!